I'm trying to check in online to a flight from Eastern Europe to the US that I booked with SWISS. However, the online form is asking me to specify a country in the "Valid for" list, to which I have no idea how to respond. I would go out on a limb and say "US", but that information would be redundant! It already knows I'm flying to the US and it asked me about my US visa information. 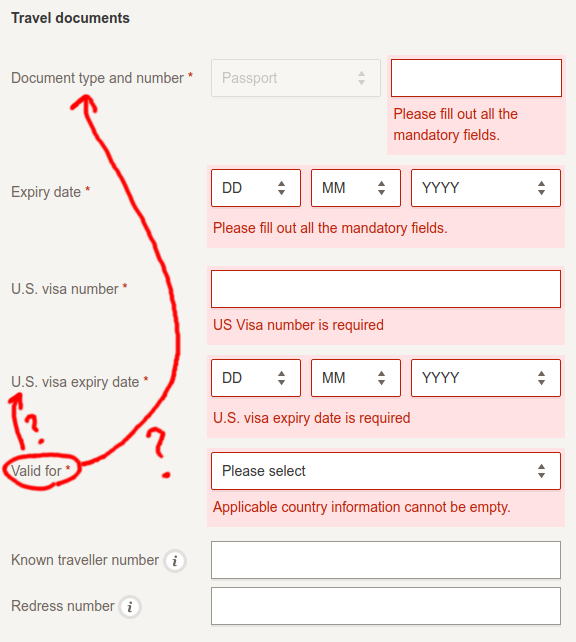 I mean, it should be logical to assume that if a person has a US visa, it would be valid for the US, right? Another guess I had is to specify my home country that issued the passport, but that would make even less sense, as the passport is meant to be "valid for" the entire world. So what country should I specify in the "Valid for" field? I'm personally not very happy with the lack of common sense in the way the check-in form is composed, but that is the official answer. I can only guess that for some other destinations it is not as obvious whether or not a visa for one country would also allow entry to some other country due to some international agreements. Upd: I followed the given advice and had no issues with the flight, expect for catching a cold on my way there because climate control in Swiss's airplanes is apparently not a thing, even in cold Russian winters. Not the answer you're looking for? Browse other questions tagged check-in swiss or ask your own question.